I notice a pest problem. I wait to see what happens. The most recent example started last fall, when I noticed a proliferation of large garden snails from who knows where, leaving slime trails on the chard. I read about preparation of escargot out of curiosity but never did anything effective about the snails, because I was busy and there were so many other things to eat. 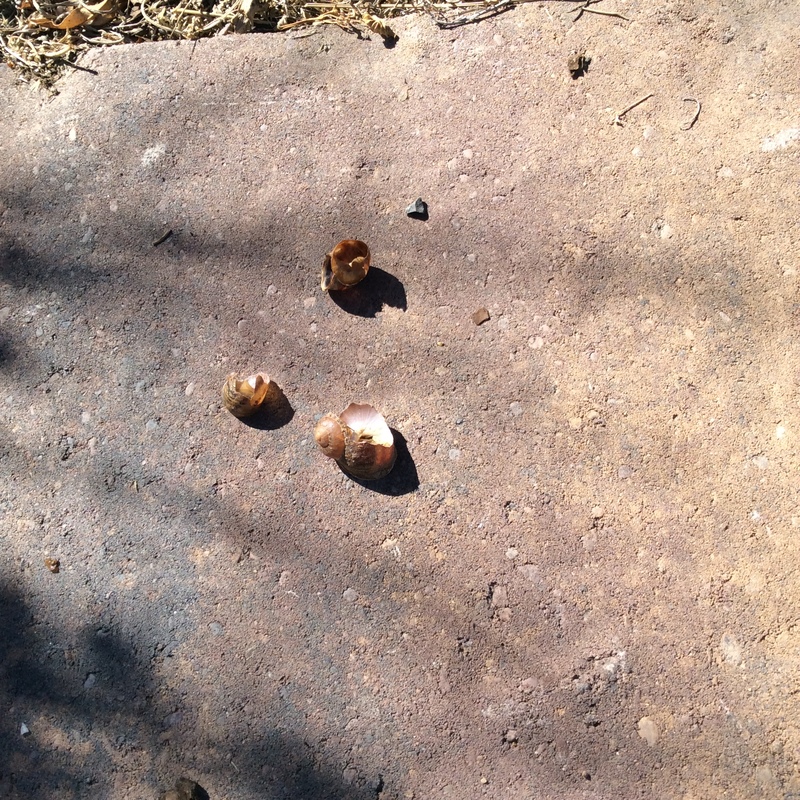 Snail shells, broken open and empty, appeared all over the place. 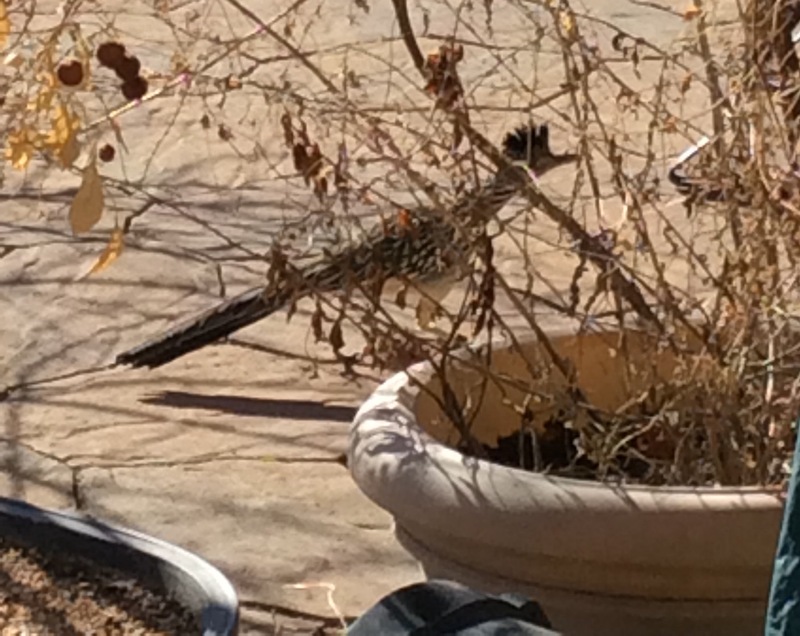 Further observation revealed that a roadrunner, our local little feathered velociraptor, had taken over my yard and was exploring the mulch and eating all the snails, as well as a few stray mice. With the first warm day of spring he began strutting on my roof, calling for eligible females. 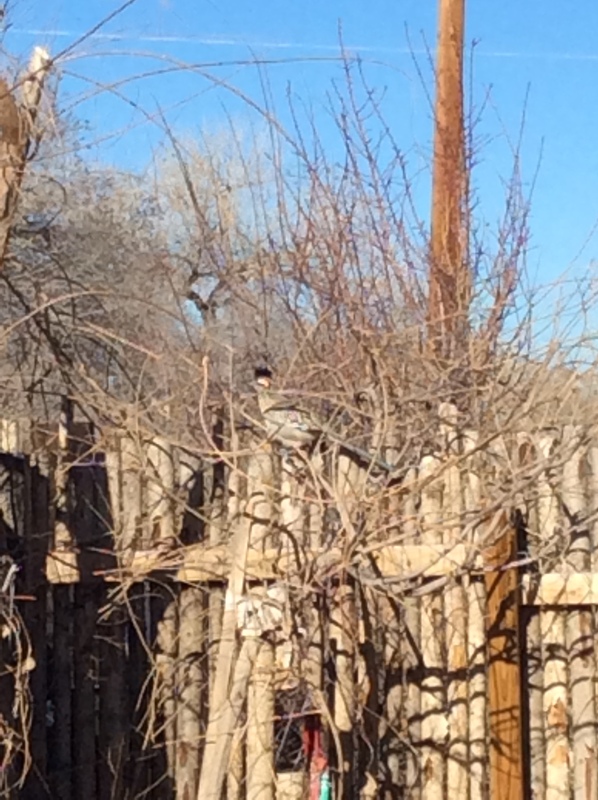 I keep trying to photograph him, but roadrunners are wary and fast. Most of my photos of him are just a blur. The ones at the top and bottom of this post, where at least you can sort of see him, are the best I could do. A sharp-shinned hawk has started nesting nearby and this helps keep the mice and English sparrows down. Yes, he hunts at my bird feeder occasionally. Hawks have to live too. My much-loved Toka plum tree gets an aphid infestation every year after leafing out, although none of my other plums do. Ladybugs move in and decrease them, and the remaining aphids are certainly unattractive but don’t diminish yield in the slightest and are gone by early June. Cabbage loopers put a few holes in my collard leaves every year. No issues. I feed those leaves to the chickens and eat the others. Squash bugs spread viruses that are hard on my zucchini. But I am no worse afflicted than people who spray. My point is that we are gardeners and urban homesteaders, not commercial farmers. Also, we typically have day jobs and limited time to attend to our crops. So why spend it trying to exterminate things that don’t do that much harm? Wait and see, and if a planting fails, other plantings will succeed. Before fixing, wait to see if it’s really broken. Meanwhile, eat something else. There’s plenty.